, an eminent father of the church, was born at’Tagasta, Nov. 13, in the year 354, of his father Patricius, a citizen of that place, and his mother Monica, a lady of distinguished piety. He first applied to his studies in his native place, and afterwards at Madora and Carthage. In this latter city his morals became corrupted, and he had a son born to him, named Adeodat, the fruit of a criminal connexion. He then became a proselyte to the sect of the Manichaeans, and an able defender of their opinions. 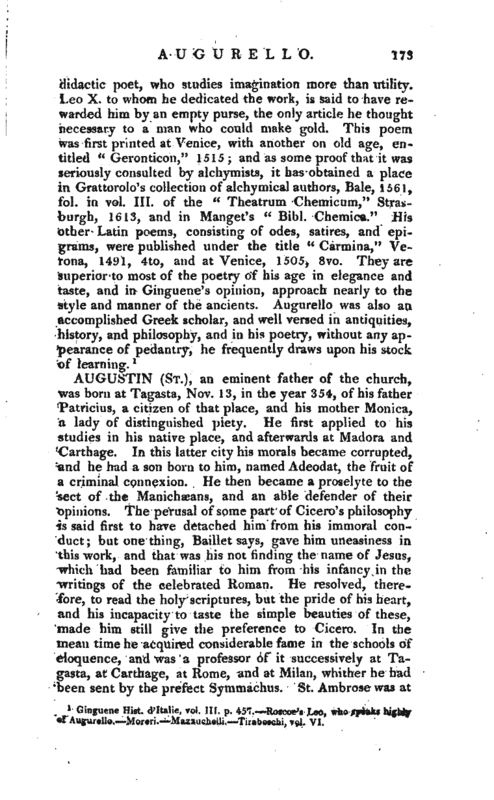 The perusal of some part of Cicero’s philosophy is said first to have detached him from his immoral conduct; but one thing, Baillet says, gave him uneasiness in this work, and that was his not finding the name of Jesus, which had been familiar to him from his infancy in the writings of the celebrated Roman. He resolved, therefore, to read the holy scriptures, but the pride of his heart, and his incapacity to taste the simple beauties of these, made him still give the preference to Cicero. In the mean time he acquired considerable fame in the schools of eloquence, and was a professor of it successively at Tagasta, at Carthage, at Rome, and at Milan, whither he had been sent by the prefect Symmachus. St. Ambrose was at | this time bishop of Milan, and Augustin, affected by his sermons, and by the tears of his mother Monica, began to think seriously of forsaking his irregularities and his Manichasism. He was accordingly baptised at Milan in the year 387, in the thirty-second year of his age, and renouncing his rhetorical pursuits, studied only the gospel. On his return to Tagasta, he betook himself to fasting and prayer, gave his property to the poor, and formed a society ainorrg some of his friends. Some time after, being at Hippo, Valerius, then bishop of that diocese, ordained him a priest abaut the commencement of the year 391. Next year we find him disputing with great success against the Manichees, and in the year 392 he gave so learned an exposition of the symbol of faith, in the council of Hippo, that the bishops were unanimously of opinion he ought to be chosen one of their number. In the year 395, another council appointed him coadjutor to Valerius, in the see of Hippo, and it was in this situation that the spirit and virtues of Augustin began to display themselves. He established in the espiscopal mansion a society of clerks, with whom he lived, and became more active in his opposition to heresies, particularly the Manichuean, converting one Felix, a very celebrated character among them. Nor did he less prove his judgment and eloquence in a conference between the Catholic 1 bishops and the Donatists at Carthage in the year 411, where he bent his endeavours to procure unity in the church. His great work “On the city of God,” now made its appearance. In the year 418, a general council was held at Carthage against the Pelagians. 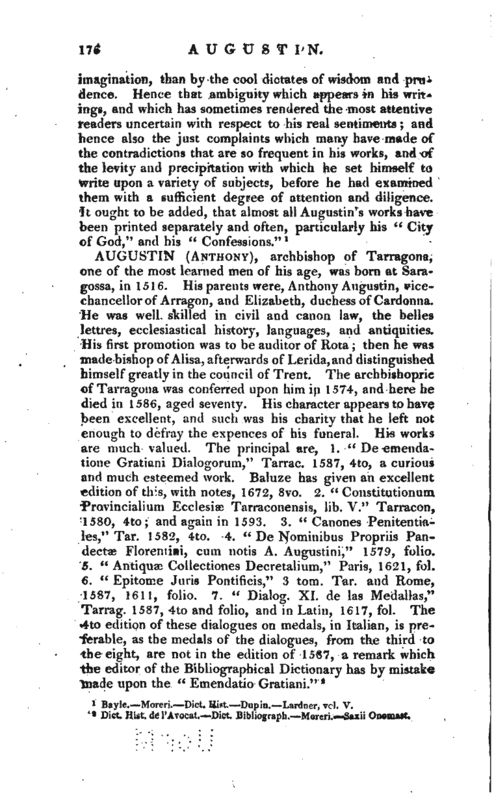 Augustin, who had formerly refuted their errors, now prepared nine articles against them, and evinced a zeal on the subject, which procured him the title of the “Doctor of grace.” After having thus triumphed over the enemies of the church, he had to contend with those of the empire. The Vandals, who had passed from Africa into Spain, under the conduct of their king Genseric, in the year 428, made themselves masters of a considerable part of that country, but Carthage and Hippo resisted them a long time. 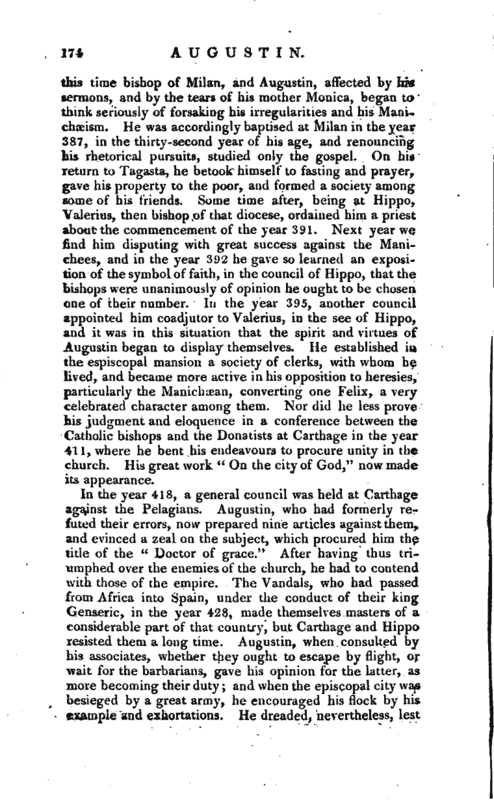 Augustin, when consulted by his associates, whether they ought to escape by flight, or wait for the barbarians, gave his opinion for the latter, as more becoming their duty and when the episcopal city was besieged by a great army, he encouraged his flock by his example and exhortations, He dreaded, nevertheless, lest | Hippo should fall into the hands of the enemy, and prayed to God that he might be taken away before that calamity happened. His prayer, it would appear, was answered, as he was cut off, during the siege, by a violent fever, on the 2Sth of August, in the year 430, at the age of seventy-six. The Vandals, who took Hippo the year following, showed respect to his library, his works, and his body. The catholic bishops of Africa carried his body to Sardinia, the place to which they were driven by Thrasamond, king of* the Vandals and Luitprand, king of Lombardy, caused it to be conveyed, nearly two hundred years after, to Pavia. His works have been printed at Paris in 1679 and 1700, in eleven volumes, folio. 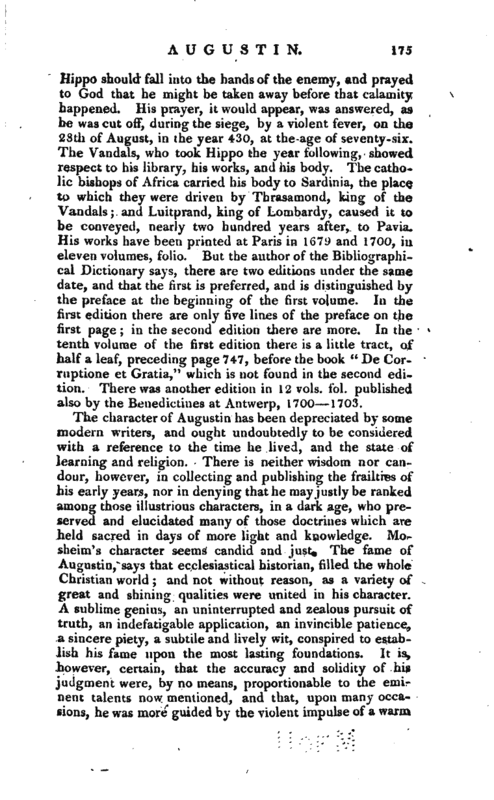 But the author of the Bibliographical Dictionary says, there are two editions under the same date, and that the first is preferred, and is distinguished by the preface at the beginning of the first volume. In the first edition there are only five lines of the preface on the first page in the second edition there are more. In the tenth volume of the first edition there is a little tract, of half a leaf, preceding page 747, before the book “De Corruptions et Gratia,” which is not found in the second edition. There was another edition in 12 vols. fol. published also by the Benedictines at Antwerp, 1700 1703. Bayle.—Moreri. —Dict. Hist. Dupin. Lardner, vol. V.